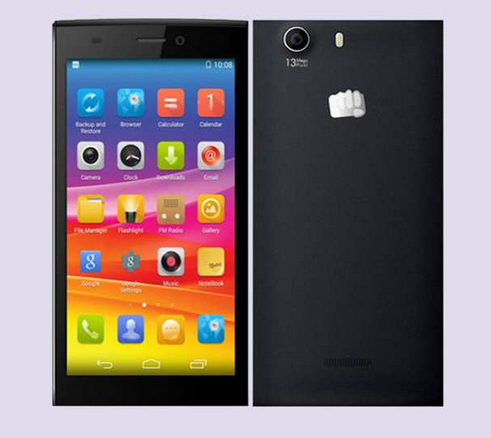 Micromax Canvas Nitro 2 E311 is the third phone to launch in Nitro series after A3110 and A3111. The specifications don’t divert much from norms set by other two devices, but on the outside the phone is much slimmer with a 7.5 mm waistline, which has also resulted in marginally smaller battery. Imaging hardware remains same. Canvas Nitro 2 E311 includes the same 13 MP rear camera and a 5 MP front camera for selfies. The camera performance of original canvas Nitro wasn’t exactly impressive, thus if Micromax is using the same hardware software combination, this one too is expected to be average performer. Internal storage is 16 GB and can be further expanded by another 32 GB using MicroSD card support. This should be good enough for most users. Processor used is 1.4 GHz quad core MT6592, which is the low end variant compared to 1.7 GHz MT6592 used in other two Canvas Nitro variants. This isn’t necessarily a bad thing as will result in improved battery backup for basic and moderate users. The chipset is aided by ample 2 GB RAM for efficient multi-tasking and Mali 450 GPU. Battery capacity is 2400 mAh and since original Canvas Nitro had great battery performance we are positive about what to expect from Nitro 2. Micromax claims 9 hours of talk time and 250 hours of maximum standby time. The battery inside is removable. The IPS LCD display is 5 Inches in size and offers 720p HD sharpness resulting in 294 pixels per inches. This is certainly good enough for the price. If you are more passionate about bigger display size, there are several 5.5 Inch options available in the same price bracket. Other features include Android 4.4 KitKat with some customizations and preloaded apps. Other features include Proximity, Accelerometer, Ambient Light and G- sensor. Micromax Canvas Nitro 2 E311 will compete with phones like Lenovo A7000, Yu Yureka and Huawei Honor 4x in India. Micromax Canvas Nitro 2 E311, sounds a bit overpriced considering today’s market and the current price of other Canvas Nitro equivalents. However, if it successfully refines the Android experience offered by earlier variants of Canvas Nitro, it would be worth buying for basic and moderate users.